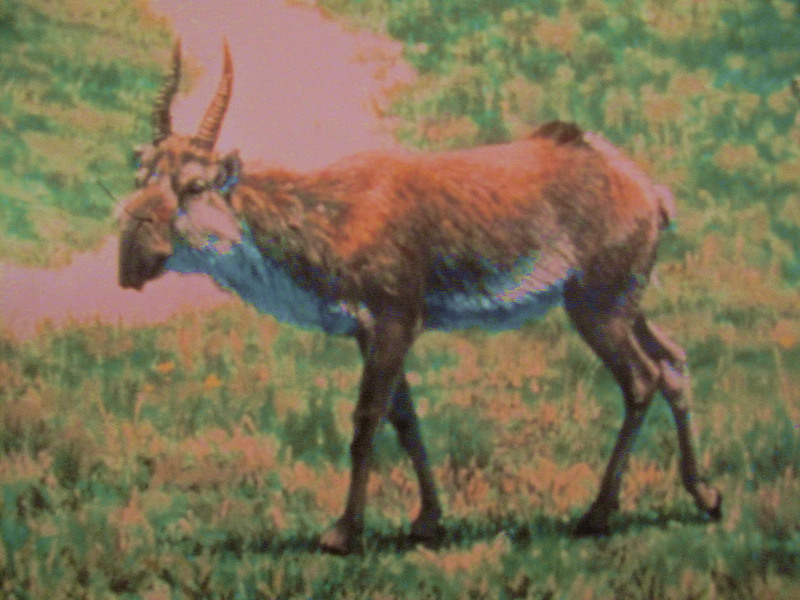 Herds of Saiga Antelope crossed Beringia from Asia. The last known Saiga in Canada was about 12,200 years ago. When the Ice Age ended, it is thought that Saiga Antelopes did not adapt to the changed habitat and died out in North America. In September of 1993, children playing on a placer claim on Last Chance Creek near Dawson City, discovered a horse’s shoulder bone with a scrap of flesh still clinging to it. Jefferson’s Ground Sloth is one of the most unusual of North American Ice Age mammals. 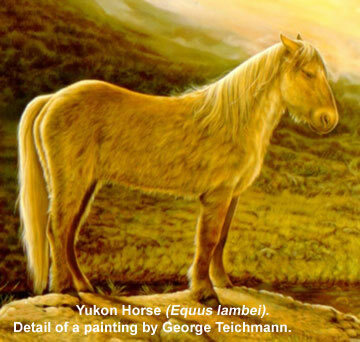 One of several species of sloths that lived in the Western Hemisphere, this one was named to honour U.S.
Equus lambei was a small horse about the size of a modern pony. It had a long, flowing, blondish mane. During the last Ice Age, it roamed in large numbers in the area now known as the Yukon and Alaska. The giant beaver is one of the largest rodents ever known. It could grow to be 2.5 metres long and weigh 218 kg. The vegetation of Ice Age Beringia was a mosaic of different plants. Today it is possible to learn about this vegetation by studying preserved pollen and the remains of the plants themselves. The Bluefish caves are an archaeological site located in the northern Yukon, 50 kilometers southwest of Old Crow. The 3 caves, actually limestone shelters, occur at the base of a limestone bedrock ridge, along the mid-course of the Bluefish River, about 200m above the valley floor. Mastodons were large elephant-like animals. They have been extinct for about 9,000 years. Their remains have been found all over North America. The last glacial episode between 20,000 and 10,000 years ago marks the transition between the end of the Pleistocene epoch, about 10,000 years ago and the beginning of the Holocene, the epoch in which we live. KANTISHNA HILLS PIONEERS is an Alaska Video Production Documentary about the Gold Rush Era that occurred in interior Alaska in the early 1900’s The location was both in and near the present day Denali National Park and Preserve.